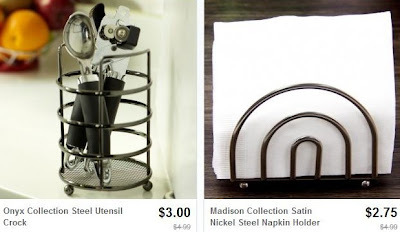 $2.75 Steel Napkin Holder, $3 Utensil Holder & More Kitchen Deals + Possible FREE Shipping! Wow! Head over to Totsy and check out their Kitchen Decor & Storage sale to find tons of great kitchen items at great prices! Not pictured is a really nice 2-tier fruit basket for $7, $3 paper towel holder and $2.75 sink protector. Even better, if this is your first Totsy purchase within 30 days of creating your account, you'll get free shipping!